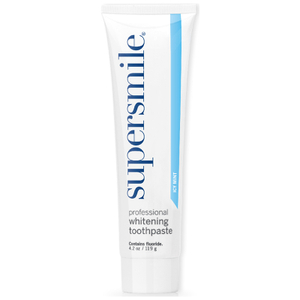 SuperSmile's Fluoride Free Whitening Toothpaste brightens teeth 273% more effectively than the leading national brand. Formulated with Calprox®, it works by gently dissolving the protein pellicle - a thin layer of protein that forms on the tooth surface, and to which plaque, bacteria and stains adhere. Removing the protein pellicle leaves the teeth feeling cleaner for a longer period of time. Baking Soda provides long-lasting germicidal protection to ensure fresher breath and to prevent gum disease, while Calcium and Phosphates work to re-mineralize tooth enamel. Since it contains no gritty silica - the abrasive ingredient commonly used in commercial toothpastes to scrape away the pellicle – this Fluoride Free Whitening Toothpaste is 75% less abrasive than the recommended standard set by the American Dental Association. Original Mint flavor. 1.On a DRY toothbrush, place a pearl size drop of Whitening Toothpaste. Inactive ingredients: Water, Sorbitol, Dicalcium Phosphate Dihydrate, Sodium Bicarbonate, Calcium Carbonate, Titanium Dioxide, Cellulose Gum, Calprox®, Sodium Perborate, Flavor, Corn Starch, Magnesium Carbonate, Sodium Lauryl Sulfoacetate, Sodium Saccharin. This tooth paste is very good to whiten teeth if you use it on a regular basis. I have been using Supersmile for several years and would not use anything else. If I try something else cheaper, the yellow comes back. 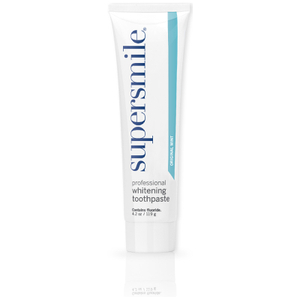 This toothpaste is very effective but it is much more expensive than drug store buys.